Like many guitarists in the late sixties and early seventies Davidâ€™s secret weapon in creating his magical tone was blending his Hiwatt amps with rotating speakers. The effect can be heard on many Floyd recordings and was an essential part of Davidâ€™s live tone between 1971-83 and again in 1994. 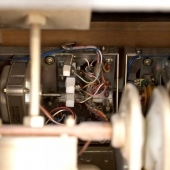 In this article weâ€™ll look at the Yamaha RA-200 cabinet David used between 1976-83. Donald Leslie designed the Leslie rotating speaker cabinet in the mid 1940s. 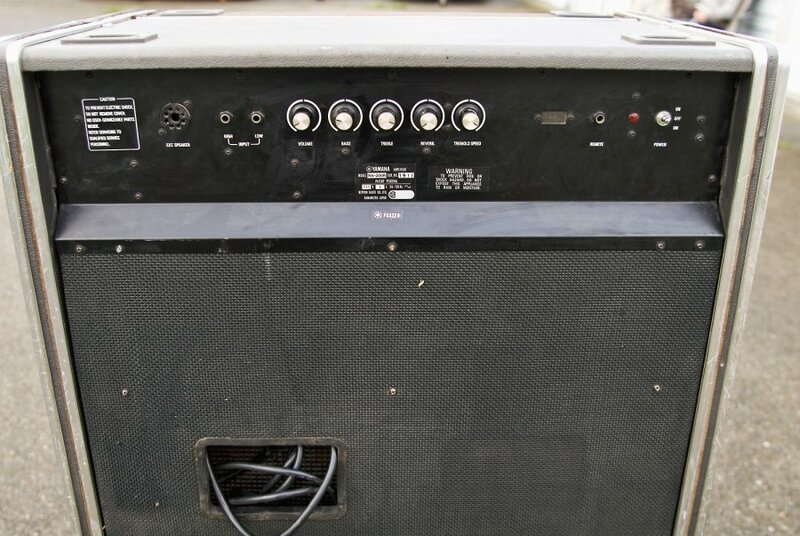 The amp was originally intended for Hammond organs simulating the Doppler effect â€“ the tone is pitched up and down by the rotating horn, like the effect of an ambulance driving by. The cabinet consists of a top treble rotating horn and a bass sub with a rotating sound baffle. The Leslie soon became a popular effect for both guitars and vocals, in addition to being the main amp for most organs. â€¨â€¨David used a Leslie on his compositions on Ummagumma and on a couple of songs on Atom Heart Mother but it was around Meddle that he integrated the speaker in both his studio and stage sound. Between 1971-1975 he is seen using different Leslie cabinets on stage and most of Dark Side of the Moon and Wish You Were Here were recorded with Hiwatt and Fender amps and a Leslie cab. See the David Gilmour Gear Guide for each album for more details. 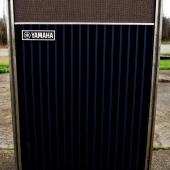 The Yamaha RA-200 was introduced in 1976 and unlike most of the Leslie cabinets, the Yamaha is a 200w solid-state amp â€“ no tubes. It has three rotating speakers in the top compartment, rotating in the same speed on an axis rather than the usual horizontal spin. 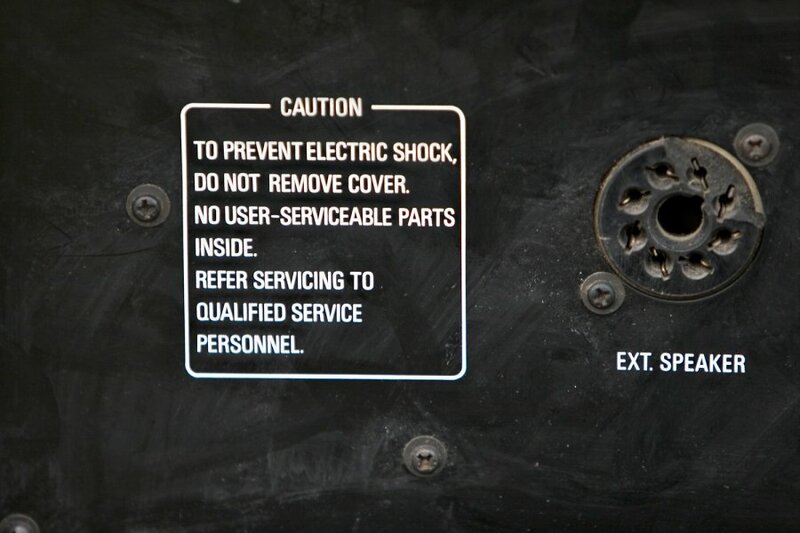 In addition, the main compartment has four Yamaha JA3052a 12â€ 60W stationary speakers. 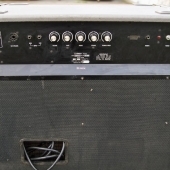 Three amp circuits power the cab â€“ one for the rotating speakers and two for the main speaker cab. 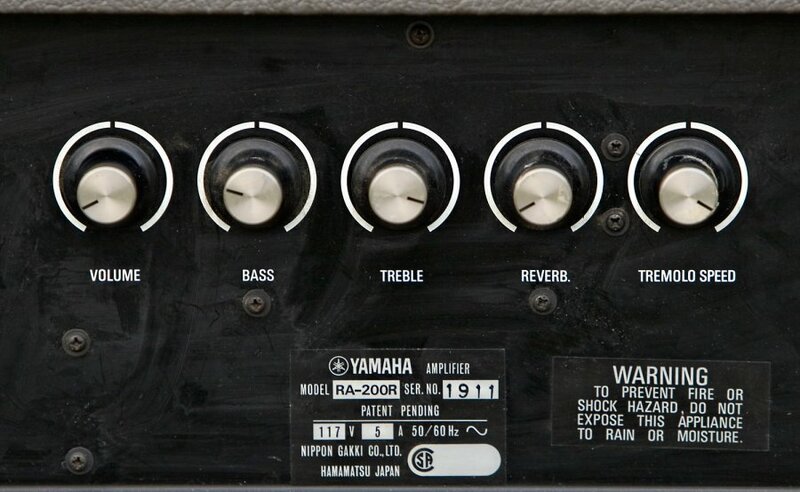 A back panel has the usual amp control knobs â€“ volume, bass, treble, reverb (that can be used with both the rotating speakers and the lower compartment) and tremolo speed (controlling the slow speed â€“ the max speed is fixed). The guitar signal was split out of the pedal board and fed to the amps and the Yamaha cabinets, which were combined with an Alembic F-2B preamp. 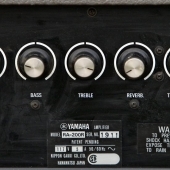 The rig also featured two Yamaha PE-200A 200w amps but it’s not documented how these were incorporated in he signal flow. 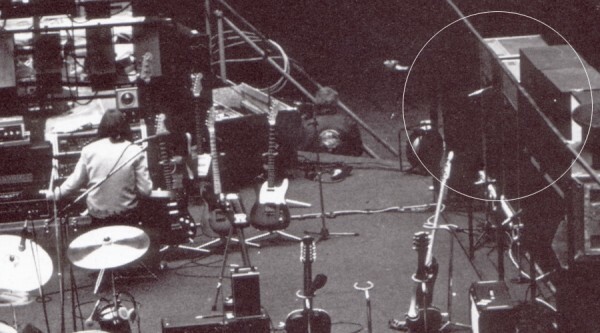 In the 80’s and 90’s the Alembic would be used as a main preamp in David’s rig with all of the preamp stages in the Hiwatts removed/disconnected. The Yamahas were mixed slightly lower than the Hiwatts adding a fuller dimension to his sound rather than being a dominating effect. The Cornish board had on/off controls for each output allowing David to use both outputs or choose between the two. From what I can gather from listening to the live shows, he would use both throughout the shows; never just the Yamahas. - This is an overview of David's corner on the Animals stage pictured during rehearsals at the Olympia Exhibition Hall in early 1977. You can see the two Yamahas next to the four WEM speaker cabinets. 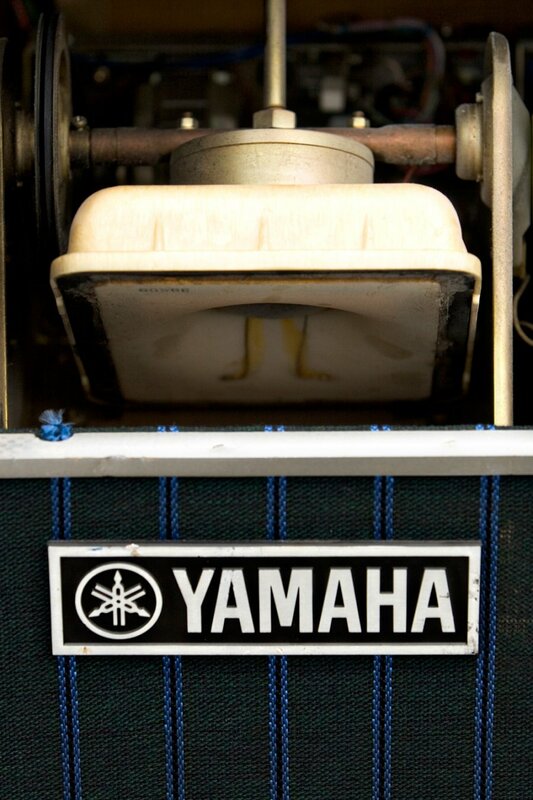 David used the same setup on the Wall tours in 1980-81.
â€¨Perhaps the best example of the Yamahas is on Davidâ€™s self titled solo album from 1978. 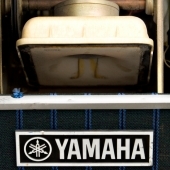 The Yamaha features as a main effect on songs like Raise My Rent and Itâ€™s Definitely. Unlike on stage or The Wall, where the Yamahas were mixed much lower than the Hiwatts, on these songs the cabs are micâ€™ed and recorded for a much more dominating modulation. You can also compare songs like Mihalis, which is mostly the Electric Mistress with Raise My Rent and hear that slightly hollow, throaty rotating tone on both the cleans and distortions. The Yamaha was again used on the recording sessions for The Wall, notably on Davidâ€™s legendary solo on Comfortably Numb. 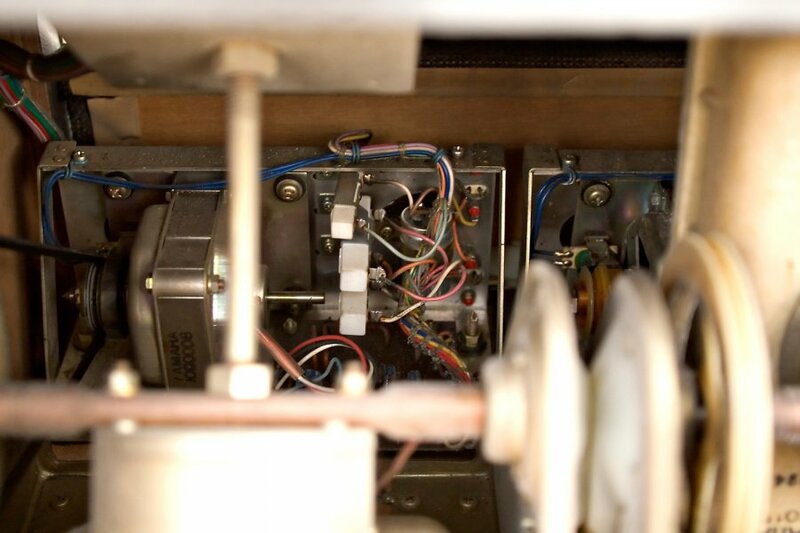 As on earlier sessions, the signal was split between the Hiwatts/WEMs and the rotating speaker cabinet. Unlike on Dogs and Raise My Rent, the Yamaha was mixed much lower than the Hiwatts like the stage setup. You canâ€™t really hear the effect but it adds a bigger dimension to the sound. Sort of rounds off the corners of the sometimes harsh distortion tones. â€¨â€¨For The Wall tour David would again use a setup including two Hiwatts with four WEM cabs and the two Yamaha RA-200 cabs. 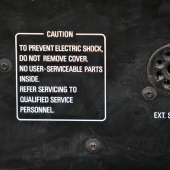 Phil Taylor also designed a method where a cable-based phase reverse system was used to keep the two cabs in synch with each other. The Yamaha RA-200 was also employed by David for the 1983 Final Cut recording sessions. 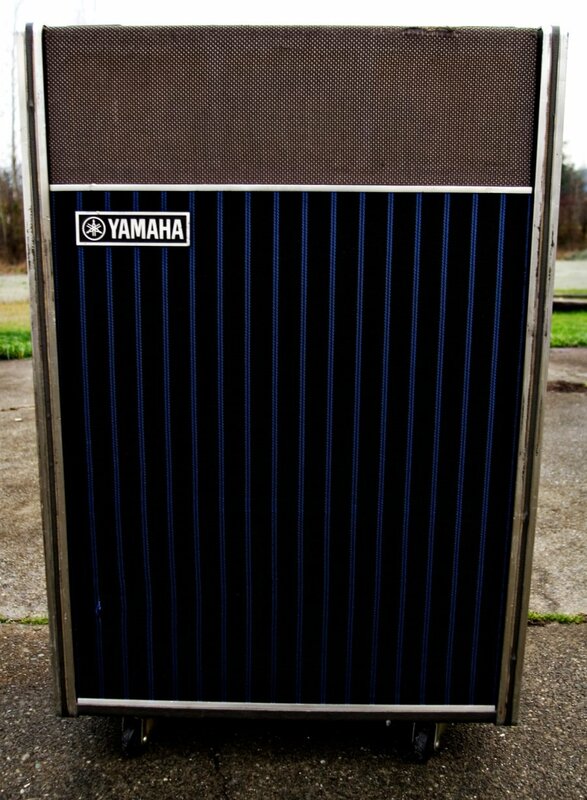 After being stored away for well over two decades, the Yamaha RA-200 cabinet is once again a part of David’s guitar rig during the Barn Jam sessions in early 2007. It’s currently located in David’s home studio Medina (Hove, UK), with the Alembic F-2B preamp and mice’d with two Neumann KM 86 on the tweeters and a Shure SM7 on the speaker. The cabinet was employed in combination with other guitar amps during the 2014 recording sessions for Pink Floyd’s Endless River. – This is a clip from the Barn Jam sessions David and the band held in early 2007 at David’s farm. You can spot the Yamaha behind David with the Alembic F-2B preamp lying on top. It adds a slight swirly tone to the Rickenbacker â€œfrying panâ€ A-22 lap steel. Gilmourish.Com contributor Josh Szczepanowski has been kind enough to share some of his experiences with the Yamaha RA-200 as a guitarist in Canadian Pink Floyd tribute Pigs. The cabinet dates back to 1975 and was until recently being used at a local hockey arena amplifying the Hammond organ used during intermissions. Josh describes the Yamaha as being loud, insanely heavy and dwarfing his Hiwatt/WEM setup in size! But as he describes it: â€œOnce I got things under control I was rewarded with a big surprise â€“ The Yamaha RA-200 honestly sounds fantastic, and nails late 70s Gilmour tones.â€ Josh further explains how heâ€™s using the cab: â€œIn my case, I run the Yamaha and the Hiwatt together. Here’s a handful of reference clips provided By Josh Szczepanowski with the Yamaha in solo. Keep in mind that the effect is much more subtle in David’s setup with the Hiwatts but this gives you an idea of how it all sounds. – Although David used the Electric Mistress as a main effect on ’77 performances you can hear how the Yamaha adds that swirly almost 3D sound to the main riff. – This is a clip of Syd’s Theme. You can hear how the rotating speakers adds a shimmery rotating effect. If you listen carefully to Shine On and the intro on Sorrow from PULSE you can hear the same tone. – On the The Wall tour David performed Run Like Hell in front of the Wall using his mini Cornish board with just an Electric Mistress and the MXR digital delay unit. The Yamaha adds a liquidy smooth attack to the tone.